Fig. 1. Dose-response relationships for the acute stimulation of GH by intravenous bolus injections of GHRH(1-44)NH2 in normal men and women. The left panel shows the increment in peak GH. The right panel shows the integrated area under the GH response curve. From ref. 5.
specifically stimulated GH secretion, with similar responses in men and cycling women (3,4). Dose-response studies showed that the ED50 for intravenous bolus administration was approx 0.3 ^g/kg body weight; a dose of 1 ^g/kg evoked a maximal peak GH (Fig. 1) (5). The range of individual responses, however, was extremely wide. This was initially noted on testing of different subjects, but then also on repeated testing of the same individual (Fig. 2) (6). Studies of the effects of continuous infusions of GHRH, reproducing some of the pathophysiology of the patients with GHRH-secreting tumors, also showed a wide variation in GH responses, with a pattern of pulses of increased magnitude compared to baseline or placebo infusions, but occurring at approximately the same times of day and night, with an increase during sleep, as seen in spontaneous GH secretion (Fig. 3) (7-9). Both of these results were interpreted as showing the variable effects of endogenous somatostatin secretion. 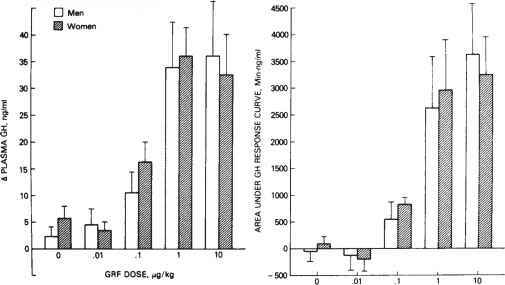 When hypothalamic SRIF was high, GH responses to GHRH would be low; when SRIF was low, responses to GHRH would be brisk. Since the bolus injections were generally timed randomly relative to endogenous secretion, GH responses would vary widely from one testing session to the next. 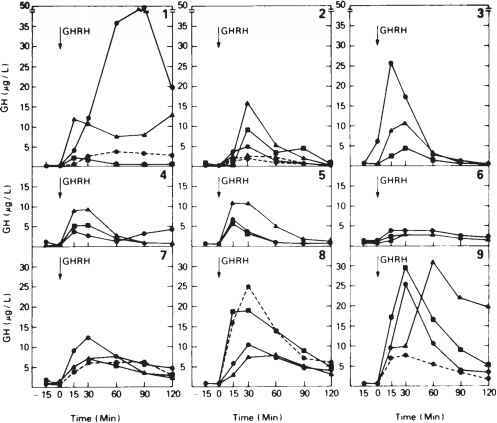 If endogenous pulses of GH secretion normally coordinated a reduction of SRIF with a surge of GHRH, it stood to reason that SRIF could control the timing of GH pulses even during continuous GHRH infusions. Fig. 2. GH responses to the acute injection of GHRH(1-44)NH2, 1 ^g/Kg iv, on separate occasions in healthy young men. Each panel shows the responses in a different subject, and each curve shows the responses for a different testing session. From ref. 6.
tion is believed to be increased, such as obesity, GHRH responses are blunted but can be restored by weight loss (12). There is now an extensive literature on the effects of various agents or conditions to modulate the responses to GHRH. Although some of these have been taken as indicating the clinical neuropharmacology of somatostatin regulation, these interpretations are subject to the usual caveats for clinical studies, where direct measurement of hypothalamic peptides is not possible, and some of these effects may reflect other mechanisms or indirect effects. For example, the marked suppression of GH responses, including the GH response to GHRH, which is seen in Cushing's syndrome can be largely reversed using inhibitors of free fatty acid secretion, an effect which may be partly somatostatin-independent (13).